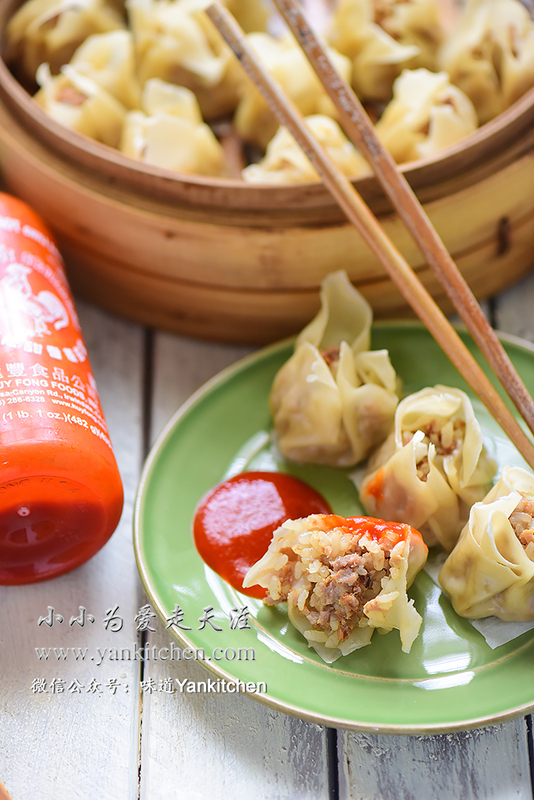 If you have been to Dim Sum place before, you might be familiar with shiu mai already. It is made with super thin wheat dough with fillings inside. There are so many kinds of fillings for shiu mai. They vary from area to area. Pork and shrimps are a very popular choice in southeast part of China. In the north, lamb, beef, and even sweet rice can be found in shiu mai fillings too. Each and every one of them is very tasty. I personally prefer the ones made with sweet rice. It is quite easy to make them at home too! With a pack of store-bought wonton wraps, we can easily make a large batch of shiu mai. Sweet rice might look like regular white rice. But they are more glutinous when cooked. That is why sweet rice is also called sticky rice and glutinous rice. Dry wild mushrooms are sold in most Asian grocery stores too. They are packed with tons of earthy, nutty, and fragrant flavors; and can be used in soups, stews, or stir fries. They can be substituted with shiitake mushrooms too. Shiitake mushroom is another kind of mushroom with distinctive fragrance and are wildly popular in Asian countries too. You shall be able in find them in almost every Asian grocery stores. Soak the dried wild mushrooms in cold water for a couple hours. I also like to buy large pieces of pork shoulder and grind them at home using a meat grinder https://www.amazon.com/STX-International-STX-3000-TF-Turboforce-Electric/dp/B0012KJBR0/ref=as_li_ss_tl?s=kitchen&ie=UTF8&qid=1534977533&sr=1-6&keywords=meat+grinder&linkCode=ll1&tag=yankitchentext-20&linkId=18cf3cfadc7cb6856f0f14dd0d742b33&language=en_US. Cook the sweet rice in a rice cooker. Sweet rice requires less water than regular rice. Allow the rice to chill for 10 minutes or so. Rinse the wild mushrooms under running water and drain them well. Chop the mushrooms in a food processor. In a large bowl, add cooked sweet rice, along with ground pork, mushrooms, oyster sauce, rice cooking wine, ginger, sesame oil, sugar, white ground pepper and salt. Gently whisk with a pair of chopsticks. Add a couple tablespoons of ground pork and sweet rice filling to center of the wonton wrap. Wrap the edges towards the center. Brush the wrap with water or egg wash if needed. Add a bamboo steamer lined with small squares of parchment paper. Repeat the process until all are finished. The listed ingredients above yield about 50 shiu mai. Freeze extra ones if they are too much for a single meal. Fill a wok with water. Cook over high heat until water boils. Add steamer. Continue to steam over high heat for 12 to 15 minutes. Isn’t it easy and quick? Sriracha sauce is great dipping sauce for shiu mai. I also use it for dumplings too.